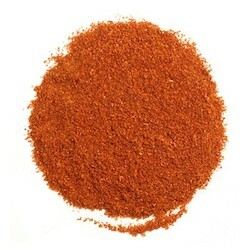 This colorful, ground chili pepper will turn up the heat and color in your cooking. Use it in some of our salad recipes, in your favorite ethnic recipes or sprinkle it on at the table whenever a dish needs extra zip. Safety Information: Chilis can be irritating to eyes and skin; use caution when handling.